A few sprigs of leftover dill inspired this pork chop recipe. This was a weeknight meal, so I wanted something quick and somewhat easy. I created this using a combination of this recipe for Creamy Dill Chicken and this recipe for Pork Chops in a Dijon Chive Sauce. I did all of the prep work and then Jon told me to hang out with our daughter and he cooked. I was creating this recipe in my mind as he went, so I was calling out instructions to him. He's a really good cook though, so I didn't have to give much guidance beyond my vision and the general order of things. 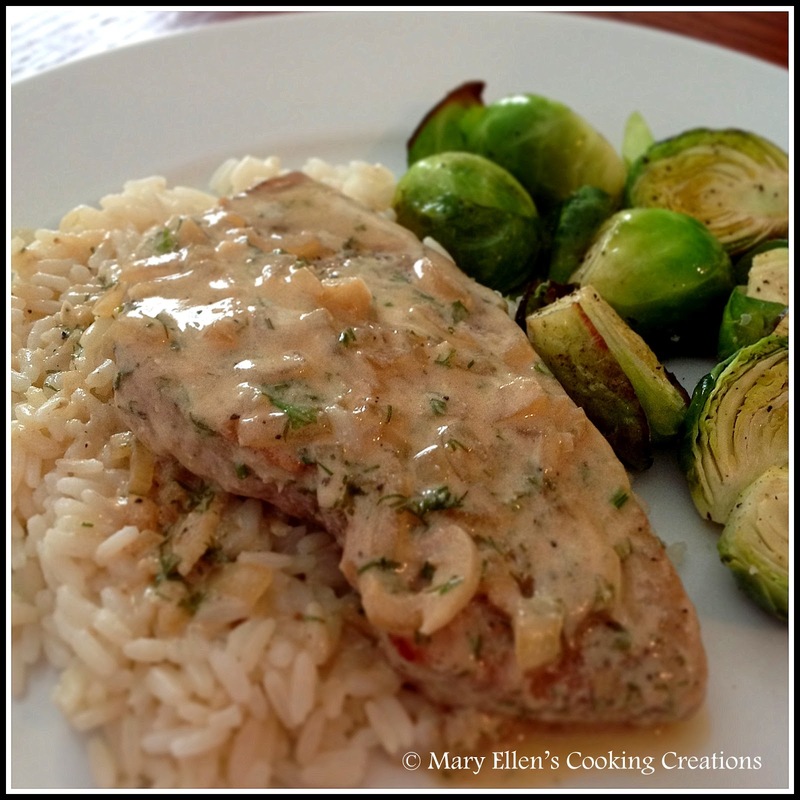 He cooked these thin pork chops perfectly - they were juicy and full of flavor. The sauce was seasoned perfectly, and was awesome over the rice (I thought I had a package of egg noodles but I didn't, but the rice was a great second choice). Our daughter who has been Miss Picky recently even ate some of it. Season the chops with salt and pepper and add them to the pan. Cook on one side until they release from the pan (about 4 minutes or so). Flip and cook until they release from the pan again, then transfer to a covered dish (approx 8 minutes total). Whisk in the sour cream; once combined, add the dill. Return chops to the pan, now over low heat, and let simmer 1 minute.